Back in my "fitness" days, I used to buy low-fat Caesar dressing because I thought "low fat" was healthy. All that cholesterol from eggs and oil surely couldn't be good for me. After going Paleo however, and getting over my fat-phobia, I'm more concerned about maximizing my intake of nutrient dense, responsibly produced whole foods while avoiding industrially produced food-like products (ie. "low fat Caesar dressing"). So, when it came time to write "Paleo Grilling: A Modern Caveman's Guide to Cooking with Fire", I knew I wanted to include one of my all time favorite recipes, Caesar salad. You won't find anything "low fat" about this recipe, but with pastured eggs, extra virgin olive oil, and those wonderful umami rich little fish known as sardines, this recipe is going to not only delight your taste buds, but it will elevate your health as well! Note: If you have a copy of "Paleo Grilling", you'll notice that I grilled the romaine lettuce before dressing it. The slight char from the grill adds an incredible flavor element to this dish, but it is by no means necessary, so that's why I'm presenting this version of the recipe here. To make the dressing: Add the anchovy fillets, garlic, and a pinch of sea salt to a food processor and pulse until combined. Turn the food processor on low and add the egg yolks, lemon juice, and Dijon mustard. Add the extra virgin olive oil in a slow drizzle until combined. Add the light olive oil, processing until thick and well combined. If desired, season with additional sea salt, fresh ground black pepper, and lemon juice. If you need to thin the dressing some, mix a small amount of water (~1 tablespoon at a time) until desired consistency is reached. To plate: Simply drizzle the romaine lettuce halves with dressing and top with roasted pumpkin seeds. Are you entertaining guests or going to a party yourself? Try a Caesar Salad bar! In addition to big bowls full of chopped romaine and my King of all Caesar's salad dressing, you could put out grilled chicken breasts, steak strips, or even blackened shrimp like the ones pictured below! 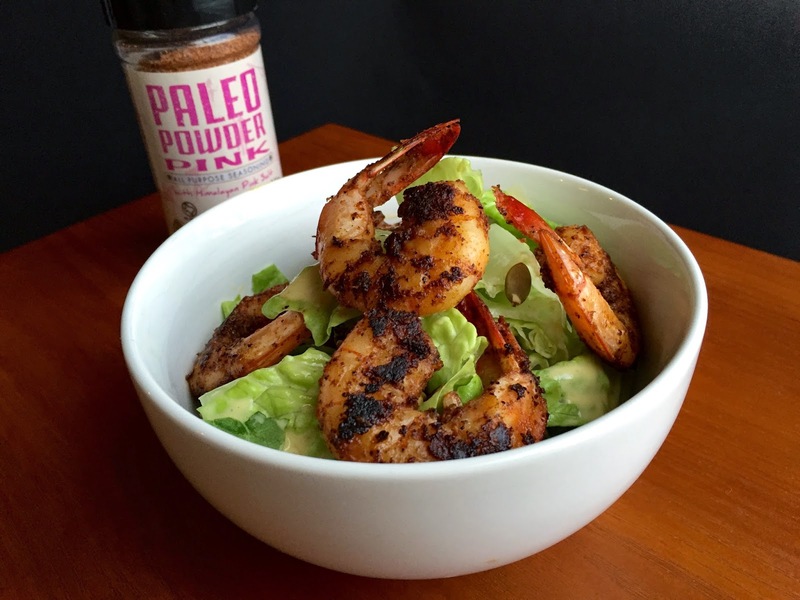 (Note: I used Pink Paleo Powder as the blackening seasoning and then just sauteed the shrimp in Kelapo organic coconut oil). You could also set out "crouton" options including roasted nuts/seeds, bacon, or other crunchy tidbits. Veggies like thin sliced red onion, halved cherry tomatoes, or shaved carrot would also make great options. I got the idea to add this bonus section from Aloha.com. Aloha makes gluten free, dairy free, soy free, GMO free super food supplements (they were recently named the top start-up in NYC) and for the month of February they are trying to encourage all sorts of bloggers to create shareable menu items that would create healthy, crowd-pleasing meals at social gatherings. Since Paleo is as much about socializing with your "tribe" as it is about eating real food, I thought it was a perfect fit for what we're trying to do in the Paleo movement. You can check out some of the other shareable meals Aloha has gathered together at the healthy recipe section of their site. You can also get a free trial of Aloha here.